China has been pouring aid to Africa but has been criticised for neglecting human rights abuse issues when investing.African states have benefited in public projects.Zimbabwe has nowhere else to turn to for credit lines.National debt g stands at $12 billion and is crippling the economy.IMF & World bank have rejected applications for aid by Zimbabwe.China is a saviour! China has lent Zimbabwe $319m (£199m) to ease electricity shortages by expanding its Kariba hydro power station, Zimbabwe’s Finance Minister Patrick Chinamasa has said. The project will take four years to complete and increase Kariba’s capacity by 300 megawatts (MW), he said. 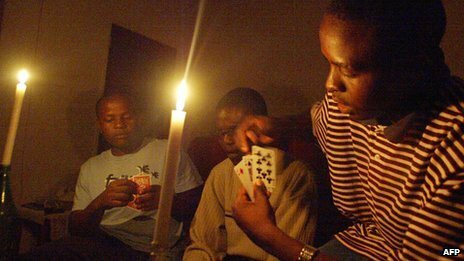 Zimbabwe often faces power outages, affecting households and businesses. The deal highlights the “Look East” policy Zimbabwe adopted after falling out with Western powers. Mr Chinamasa signed the deal with the vice-president of the state-owned China Exim Bank, Zhu Hongjie. “This should go a long way in reducing power outages… For us the energy deficit has hamstrung the growth of our economy,” Mr Chinamasa said. Zimbabwe produces about 1,200 MW of electricity but peak demand is 2,200 MW, Reuters news agency reports. The loan will attract annual interest of 2% and has a repayment period of 20 years, Mr Chinamasa said. China was a strong supporter of Zimbabwe’s independence struggle against British colonial rule. The two countries strengthened ties after the European Union (EU) and US imposed sanctions on President Robert Mugabe and his inner-circle after Zimbabwe’s 2002 elections. The Western powers said the sanctions were in response to human rights abuses and political violence under Mr Mugabe’s rule. In March, the EU suspended sanctions against 81 officials and eight firms in Zimbabwe. The decision followed peaceful referendum on a new constitution which expands civil liberties in Zimbabwe organised by a coalition government. Sanctions are still in force against 10 people, including President Mugabe. Posted on 11th November 2013 by newsafrica. This entry was posted in Africa, Headlines, Zambia, Zimbabwe and tagged Africa, China, Democracy, Headlines, Human Development, International Development, National Debt, President Mugabe, Zambia, Zimbabwe. Bookmark the permalink.